So the dreaded day of sending-off your young adult to their dorm or other new transition has arrived and you are only days away from returning to a home minus someone you brought home to raise. Of course, I am also excited for my son and overwhelmingly proud of him for reaching this stage in his life. Yet, we as parents must have a safe place to acknowledge that this part of the university transition can be one of the hardest moments. 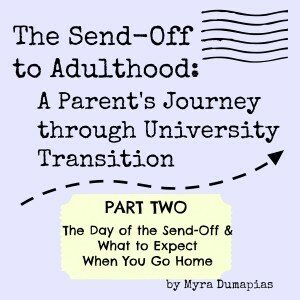 This is Part Two of The Send-Off to Adulthood: A Parent’s Journey through University Transition – The Day of the Send – Off and What to Expect When You Go Home. As I shared in Part One, I hope my sharing of my own journey will help affirm the journey of others and encourage the processing of this transition. By sharing my story in Part One, I found that it has helped me move through this transition. I hope it will encourage you to share as well, below in the comments and within your circle of support. I was both dreading it and excited for my son. 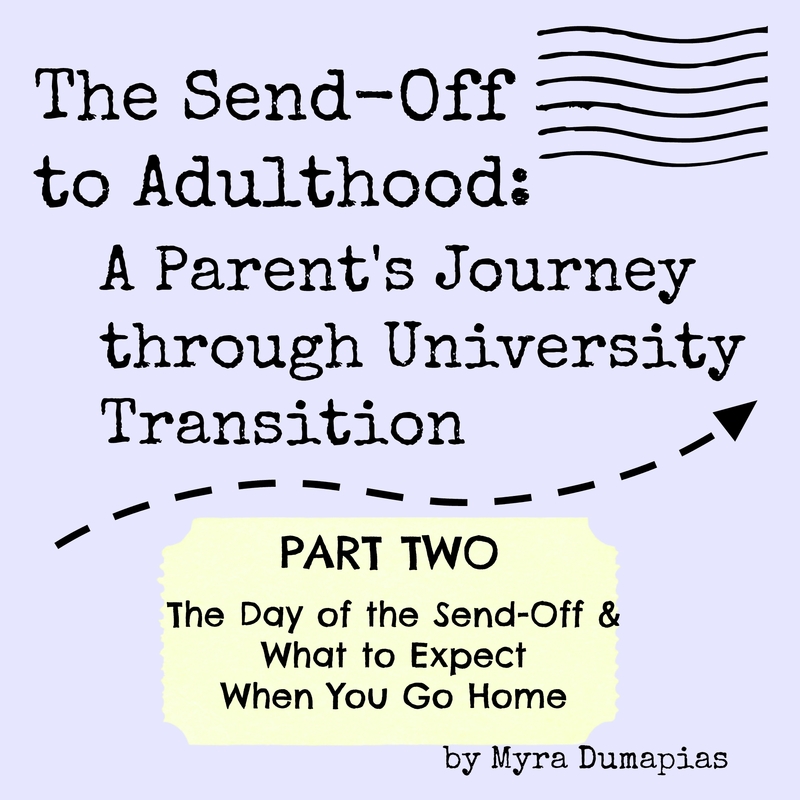 Processing the emotions leading up to this day, as I did through the process of writing What I Wish Someone Warned Me about the Send-Off helped me tremendously. Between the logistical tasks that needed to be taken care of and the fact that we as a family didn’t have privacy to huddle and cry like it would have the effect of a game plan strategy for how to win the day emotionally, I held myself together as much as a mother can. 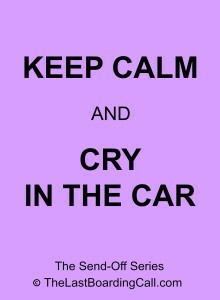 Keep calm and cry in the car. 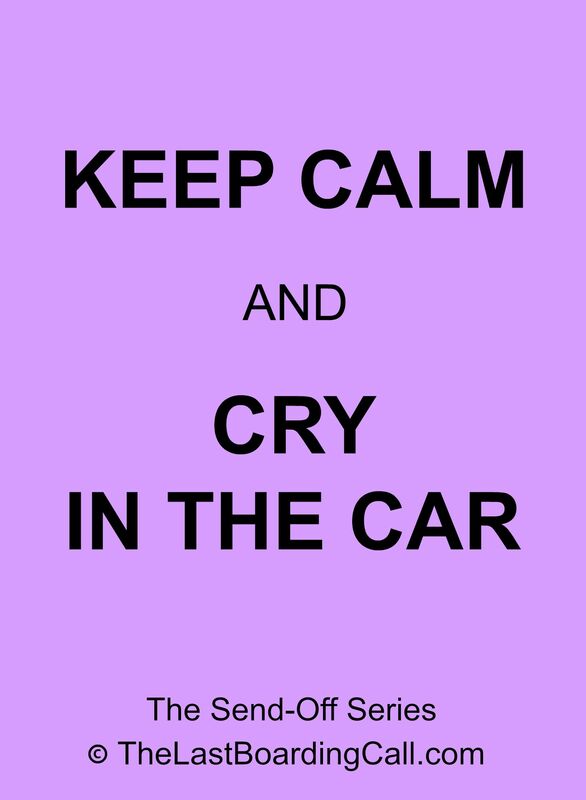 Unless you have a expressionless-cry face that allow you to tear but without the dramatic expressions or don’t mind people seeing your cry today, I suggest to cry in the car before you step out and when you step back in. If you have anything emotional to say that you didn’t get a chance to say before you left the house, say it in the car, before the hustle and bustle of the move-in day starts. Chances are, however, that you all will be too busy on this day to have time to be as emotional as you have been at home. Seeing more of my son’s self-determination helped me have less concerns about his adjustment. Get out of the way helpfully. Allow your young adult to focus on what they need to get done in the way that makes sense to them. There is most likely a part of them, even if it is small, that is trying hard to not succumb to the overwhelming mixture of sadness, excitement, fear, and tremendous courage. As I helped my son with little but practical things that wouldn’t get in his way of taking charge of how to handle move-in day and the move-in week schedule, I started to see more and more of his personal self-determination come out. Seeing more of my son’s self-determination helped me have less concerns about his adjustment. If he made any mistakes along the way today or this week, I had faith that he would learn from it and that it wouldn’t be the end of the world. For someone with some OCD tendencies, this was a big step for me, but observing how he has been becoming more and more mature this summer helped me let go. Day one of being their own boss. Today is a day your young adult will need to be the boss while receiving your age-appropriate guidance. It’s a smoother drop from being a co-boss on the day of the send-off to being the only boss after the family leaves for your young adult than being completely dependent on parents until the last minute. Allowing them to take ownership of their decisions and as a parent, balancing that task of guiding your student on a day they are most likely trying their best to be strong and brave will need to be flexible today. It would be wise to still provide solid and well-timed guidance of major things like making decisions that ensure personal safety and security, and the smarter options for purchasing textbooks. However, as young adults, they will only need to be shown how to do such things so they can practice making these decisions themselves. If they make a mistake, they will learn from it. Just like when you were younger, the lessons you learned were also the mistakes you made. As a parent, in reality, your guidance will not really end, but it will most likely involve more and more respect. Find your co-supervisor in your young adult. Certain things, like billing and matters related to your young adult’s student account, will still need to be supervised by you as a parent, of course, but you can start to share that responsiblity with your young adult. Your guidance will be teaching them how to supervise it themselves and as a co-supervisor, follow up on anything confusing while allowing them to be part of the finding the solution. If you feel like stalking your own young adult child, it’s normal (I hope) but not advisable. It’s funny looking back now, but after we emptied the car of the last of his belongings (the next day), I wanted so badly to stalk my own son around campus. How do you just leave a child you raised and just drive off? I literally visualized tiny invisible vacuum cleaners sucking the tears before they could fall from my tear ducts. Of course, he didn’t invite us to attend all the things he needed to (mostly because we might have looked like the Addams family creeping up from spot to spot with the way my eyeliner had run around my eyes and how relatively quiet I was behind my arms intentionally composed at my waist), so if I wanted to see where he’d go next, I’d have to stalk him. My senses came to me however, and I didn’t. I just stalked his bike (to make sure it hadn’t been stolen of course). I noted that it had moved and that gave me a reason to call later and follow up with him on how it was to ride around campus for the first time. To mothers for whom this day is a very dreaded day, please know that there is grace for you for things like this (but not forever). Big hugs!! It was a hard process to get through the day of the send-off. Of course, you are also excited and rejoice for your young adult’s success at coming this far. However, the type of sadness you can feel on move-in day at the dorm or other transition is not like any other because this is a child that you raised. Also, as I described in Part One, home will be so different now. Minus one at home. Visiting my son’s room, of course, felt very lonely. Especially the first few days, I had to catch myself and retrain my brain to remember I wouldn’t be hearing sounds from his room. Emotions always take longer to catch up. Not having your child at home on a daily basis can truly be very emotionally dislocating. If you are the type to need time to grieve over changes that are very emotional in nature, allow yourself to just stay home and minimize social interaction or being out in public. Unless it’s social support to help get your through this transition, you don’t need to pressure yourself to get right back in the routine of things because your daily routine, up to a few days ago, always involved your child being present when you came from your routine. Minus one while at work. Being in a job where you have been in a long time will feel different becuase at the end of the day, you most likely always looked forward to coming home, and home is different now without the daily presence of your young adult you just sent-off. You may need to develop a coping method for work (or school if you are also a student). If you need to report back to your work or other responsibilities so soon after the send-off and cannot take time off, you may need to have a way to put your emotions on hold so you can function at work. Try to take it day by day and if it helps to talk about it with certain people during your lunch breaks, just remember to choose who you speak to wisely. Make sure they can help you end the lunch break with a way that will bring you back to focusing on your job responsibilities until you can go home. Minus one on your driving route. If you are like me, driving anywhere on the streets of anywhere I used to drive just feels different. Driving the same routes I used to drive on my way to pick my son up when he was younger or drop him off felt really sad. I know this is how it feels this first week and it gets better, but just have the tissues ready during your drive. The first day, I almost wanted to just leave a tissue under each of my eye held by my sunglasses while driving around. The only thing is that my windows aren’t tinted that well. Minus one on the first grocery run. Oh boy. It’s time to do the groceries or eat something you only have in case of emergency that you wouldn’t eat under normal circumstances. If I would have thought of this sooner, I would have stocked up so that I don’t have to grocery shop within a week after the send-off. You’re in public and it’s the first time you are grocery shopping. After almost two decades (for most parents) of grocery shopping with the individual you just dropped-off away from the home in mind, this is the first time you are grocery shopping without him or her around. You now have to have the mindset that the food won’t be eaten across the table from you, or that you won’t have to buy certain things or as much. This was hard, but I made it and I know you will too. These are just some of the things I have personally experienced. When I think of parks, homes of family friends, churches and other places my son and I used to go to together regularly, I know that I will need to adjust my emotions to match more of what I know cognitively. I know the first times will be sad. The behavior part of the cognitive-emotional-behavior adjustment for this transition seems simple enough, but I know it will involve a new pairing of emotions for each behavior I used to routinely do with my son as a young child especially. If you are a parent dealing with mixed cultural expectations about what the send-off signifies, please rest in the thought that the future does not all have to be pre-determined now. Allow yourself time to just process the moment. A note about cultural expectations and the send-off: a perspective from a TCK who grew up with Filipino parents. Allow yourself to reflect on your own expectations about what this life stage means and try to communicate with your young adult child throughout the various stages of this transition. In many Asian families, a young adult going to college does not necessarily mean a breaking away from the family. Often, under a less individualistic and more kinship sense of identity, a young adult stays with the family until it is time for them to marry. It’s important to allow yourself space to grieve according to your own cultural expectations. If there are differences between your expectations and your child’s expectations of what this stage in life signifies, allow each other time for adjustment and seeing what each of you want as individuals with culture as an influencing factor. We are at the end of the day, human with certain personality traits before we identify with culture. I expect that this expectation may be fluid and depend on several factors, such as finances, the job market, and other career-related decisions, and not just culture. Also, I expect that there will be seasons in life related to the decisions that have to be made about the future. If we can rest in just experiencing the moment for how it is in the moment, it may just make it easier to process rather than being caught in “cultural expectations” as a formula to follow and create expectations with to determine the future. There are certain things I’d prefer and there are certain things my son would prefer. It will be up to us to figure it out together as a family with sensitivity and respect for one another, but it does not have to all be determined right now especially the week of the send-off. If you are a parent dealing with mixed cultural expectations about what the send-off signifies, please rest in the thought that the future does not all have to be pre-determined now. Allow yourself time to just process the moment. I hope this has been helpful to my readers. Please share your own stories in the comments below to help encourage others to process this transition. Giant hugs to all! This entry was posted in Relationships, The Youth in this Journey, Transitions and tagged a parent's journey through university transition, asian culture, CCK, cognitive emotional behavior, college kids, college transition, emotional transition, empty nest, send off to university, send-off to adulthood, TCK, the send-off to university, university transition. Bookmark the permalink.